Being a born and raised Georgia girl I am proud of where I am from and how I was raised. I was raised around good food and music-you have to admit there is just something about the south. Luke Bryan shares the same "raising" that I did. Luke Bryan grew up on a farm and spent most of his childhood on farms - hunting, fishing and just growing up. 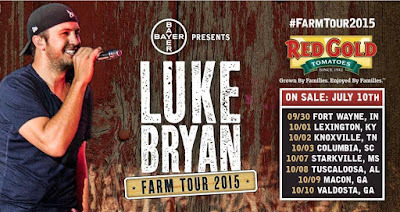 I am proud to partner with Red Gold Tomatoes to share One of Luke’s favorite recipes and more information about the Farm Tour 2015. Preheat oven to 350 degrees. Prepare rice according to package directions. Meanwhile, saute' onion, green pepper and carrot in hot oil in medium skillet over medium heat 10 minutes. Combine hot cooked rice, onion mixture, chicken, beans, diced tomatoes, 1 1/2 cups cheese in large bowl. Spoon into lightly greased 9 x 13 baking dish. Sprinkle with remaining cheese. Bake at 350 degrees covered for 30 minutes. Uncover and bake 10 minutes or until cheese is melted.